"How can an island be so round?" asked Maui, a friend in Port Moresby, Papua New Guinea on seeing the photo I sent around. 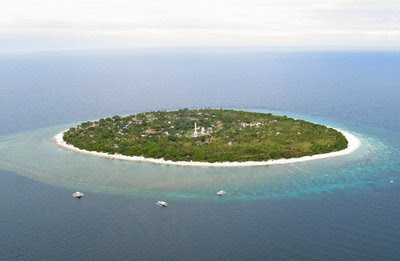 Balicasag island looks pretty impressive and awe inspiring from the air. Unfortunately, most people do not get too appreciate the beauty of this island (including myself) except for the photographer who snapped this photo. I didn't realize this was the same island I had visited in February until after I got back home. While reviewing the website for Isis Bungalows, the place I stayed at in Panglao, (Bohol, Philippines), I noticed this photo. On Balicasag island, a big section off the beach is a marine sanctuary, a popular destination for divers and snorkellers who come to Panglao, Bohol. The tour starts at 6:00 am when the guide/boatman takes off from Alona Beach in Panglao. The first stop is an area where the flotilla of bancas of different sizes (paraus with double outriggers) slow down for dolphin watching. After that, on to Balicasag. The bancas stop their motor just outside of the reef, roped off with bouys. The reef is just under 3 feet of water but beyond, the water drops dramatically to a few hundred feet. Too bad Larry the guide didn't let me go on the island when I asked. His response was, with a strange look, "What do you want to do there? There's nothing to see on the island!"